Word on the street was that a new chocolate shop had come in to Prescott. So naturally, being in Prescott this past Sunday, I found myself paying a visit to this new shop. The location is in Firehouse Plaza right off the Square (behind Whiskey Row/Montezuma St.). It's right next to you if you're walking around the Square--just situated in such a way that, unless there's a shop or restaurant that you favor in Firehouse Plaza, you're not as likely to stumble across it without already knowing that it's there. So this is me reminding you exactly where it is so that you will go there. The name of this chocolate shop is Black Butterfly Artisan Chocolates. A butterfly hangs outside the doors to welcome you over. Inside, the shop is fairly simple and also intentional about details. There are open cocoa pods on display and a photo of a cocoa tree's flower on the wall--little reminders of where this chocolate came from. (It's a difficult shop to photograph because of all the light coming in from the glass wall.) The main event, though, is the glass case that houses the truffles, mendiants, and chocolate coated fruits. I have, over the years, seen many truffles. This being the case, I am usually quick now at getting a sense of their visual style and whether they appear weak, mediocre, posh, rustic, etc. Black Butterfly truffles have artistic style. Not too modern. Not rustic. Not overly glitzy. Just simple with the right touch of embellishments and enough variety in shapes, colors, and designs from one truffle to the next to keep things interesting. Let's start with the truffle that isn't in the picture below. That would be the Lavender Apricot Caramel, which was painted in pearly white with a touch of purple. (The sign on the wall, you'll note, refers to all of these as bonbons; I just call them all truffles for the sake of simplicity and out of habit.) I was mistaken with this one: I thought it was a milk chocolate, but it turns out to be white chocolate. I probably wouldn't have chosen white chocolate, but the choice turns out to be rather nice. The chocolate has a pleasant sweet-chalky flavor, and the caramel is smooth and light. You get that kind of peppery, citrusy tang from the lavender in a visible but not overpowering way. A slight fruitiness comes in from the apricot but not too much. The effect reminds me of summer and of light and fruity drinks enjoyed outdoors. It's the white chocolate specifically that keeps everything feeling light and refreshing in a way that milk chocolate probably wouldn't. It isn't overly sweet, either; it was simply fun and enjoyable. From the lightest we move now to the darkest, the Cognac. In the traditional French style, this one is more rustic in style, coated in cocoa powder (which sadly melted into the chocolate before I could get a photo--sorry about that). Yet there is still an extra visual touch: the truffle is stamped with a cocoa flower on top, making me think of letters sealed in stamped wax. This truffle is dense yet still smooth in texture, and in flavor it is rich yet with a sense of vanilla sweetness lingering about. I managed not to taste the cognac specifically until halfway through because I was focusing more on the chocolate's flavor and texture. Then I started picking up that tangy richness; it does elevate this truffle. Instead of staying with a standard French truffle flavor, it picks up more richness and individual interest. This is a sophisticated truffle, one that I can slowly savor or set as the finish to a fine dinner. It has a masculine style that goes along with dark wood libraries and leather chairs. I would definitely recommend that the Cognac be one of the truffles you try from Black Butterfly. Third is the truffle that might just have been my favorite, the Blackberry Sage. This one comes in a cylindrical shape and is painted solid purple with a design of circles on top. A couple of air bubbles show that it's handmade, while the perfectly detailed paint job shows care and attention to detail. The first flavor to come in is the chocolate, followed by the sage, then a touch of blackberry, and then more sage. From here, the blackberry and sage keep going back and forth until you finish mainly with the chocolate. Now, while the use of herbs can make chocolate exciting or unique, they can easily taste overpowering or simply odd, conjuring up images of roasted chicken instead of truffles. However, the balance of flavors in this particular truffle shows a particular restraint and a knowledge of just how much of each flavor to use. The sage gives the idea of richness to the blend while also maintaining lightness with its almost minty flavor, and the blackberry adds the idea of sweetness. Together, they form a perfect balance. To finish off, we have the Palet D'Or. This is a plain square with rounded edges and a touch of gold on top. It's a classic, elegant look, as traditional nowadays as the rolled-in-cocoa-powder French truffle style. Compared with the others, this one is much softer when you bite in because there is more ganache. I also want to call this one the sweetest of the four, although technically that title probably goes to the white chocolate. Maybe it's just that gold usually makes me think of extra dark truffles, and this one almost tends toward a milk chocolate side. It does have some rich, flavorful tones that allow for slow savoring (it finishes with a warm, nutty flavor), but overall it's on the lighter side. I'd recommend this one for people who worry that the Cognac might be too dark for their tastes. 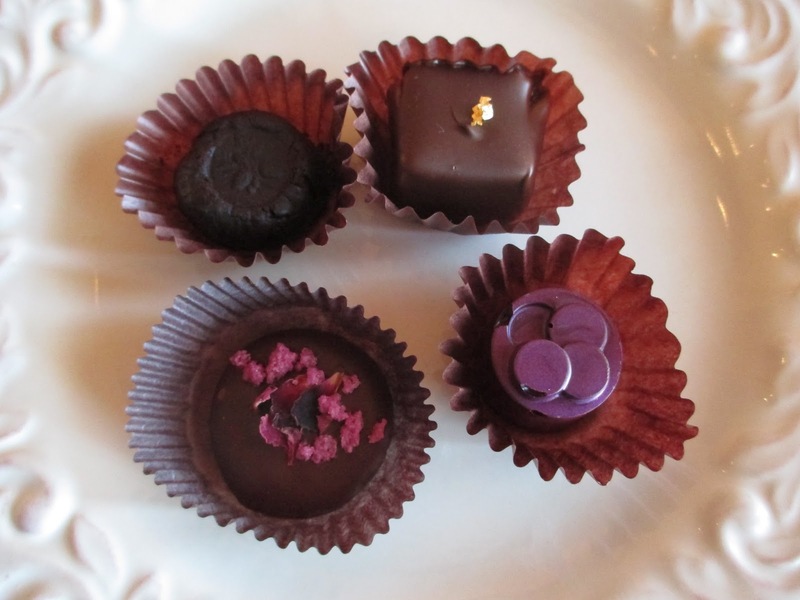 Black Butterfly's chocolatier and owner is Tracy Taylor, and from these four chocolates, I can say that she absolutely knows what she's doing and for that reason I hope her shop does well. These chocolates felt unique. They weren't exactly like others that I've had before, and yet they weren't so different that they were shocking or weird. Every element was carried out just right, and everything is in the right balance so as to delight without estranging the palate. If I'm not mistaken, Tracy makes the chocolate that she uses for the bonbons, mendiants, chocolate bark, etc. It's all from Venezuelan cocoa beans--and they're fair trade, which of course I love. She also mentioned that soon she'll be offering chocolate making classes and the chocolate will also be used for wine tastings/pairings (I'm not sure if the wine tasting will be at the Black Butterfly shop or elsewhere). So there is already plenty to look forward to in the future. I am well pleased: I really don't have any negative comments about these truffles. I'm absolutely thrilled to have a good chocolate shop in Prescott. I'm there fairly regularly, and it's a nice area that could use a shop like this--for visitors and locals alike.